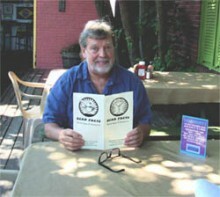 Since 1979, The Great Lost Bear has become one of Maine’s well-known and respected names in the restaurant and bar industry. Maine transplant, Dave Evans, moved from North Conway and started The Great Lost Bear in 1979 (originally The Grizzly Bear) alongside his wife and cousin. The self-proclaimed “ski bums” became inspired from the multiple restaurants and bars they each worked in throughout the years. Taking with them specific advantageous aspects of the different restaurants, they decided to put their knowledge and expertise to work. When you walk in you are immediately drawn to the visual history of The Bear. Both walls and ceilings are full of memorabilia that depict the changes and growth this business has experienced, the most notable being their expanding beer menu. When the doors first opened there were eight taps available, growing rapidly to its current sixty-nine. The changing of the season also signifies a changing of the taps. Most of the local breweries that The Bear carries have seasonal brews; Summer, Winter and most notable are the Halloween flavors. It takes two massive walk-in coolers and two kegerators to house the varieties of beer offered. Every Thursday night between 5-9 Great Lost Bear presents a Craft Beer Showcase. A staff member or the occasional special guest will spin the Wheel of Destiny to determine which of the savory brews will be featured that week. While enjoying the famous wings and locals brews, take a shot at the “Question of the Day”. Every day a new trivia question is posted on the chalkboard behind the bar, answering it correctly earns you a free beer. If only school had such an incentive! There is plenty of seating room within The Bear around the bar and the off in the sectioned dining areas, or if you prefer you can enjoy the summer days outside on the back patio. Dave and the GLB crew are very active in the Portland community. Not only have they been a generous underwriter with WMPG for over 10 years, they support many other local businesses. Allagash Brewing Company, located right here in Portland, has their very own place within The Bear called “Allagash Alley”. Here you will find 5 different Allagash brews available year round. The menu contains specials that feature locally grown produce, such as the phenomenal Farmers Market Pizza. The Great Lost BearAll About Beer Magazine boasted The Great Lost Bear was their “idea of a perfect bar” and was named the “Best Beer Bar in the U.S.A” in 2008 by CHEERS Magazine. At the Great Lost Bear website there is more information on the events, updates, news, specials and photos, and you may sign up for “The Bear’s Growl”, a weekly online newsletter. If you stop in at the Great Lost Bear, please thank the folks for supporting Community Radio, WMPG.